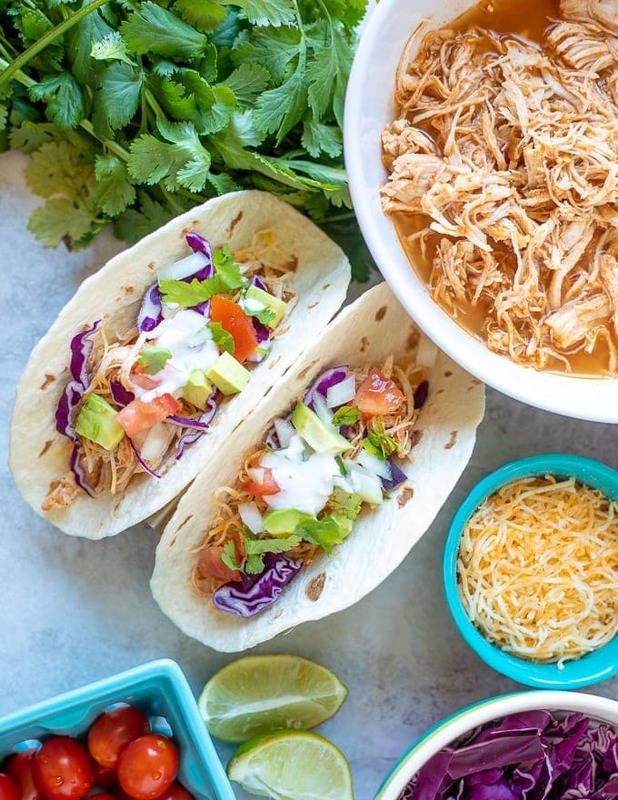 Taco night just got a whole lot easier with these Instant Pot Chicken Tacos! This recipe for Instant Pot Chicken Tacos is simple and made with ingredients you probably have lying around–but the flavor is spectacular! While we love these Chicken Tacos, you may be interested in Lentil Tacos, Easy Tacos with Ground Beef, or Pork Tacos, Buffalo Chicken Tacos for delicious Taco Night recipes as well. 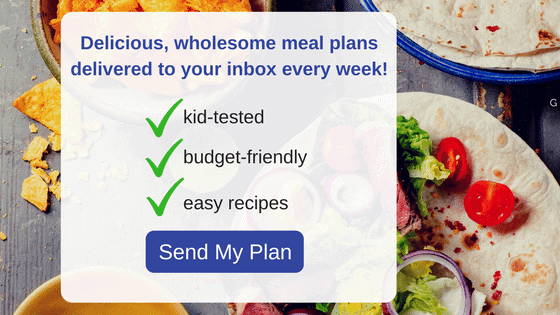 If you are looking for more Instant Pot Recipes, please check out all Instant Pot Recipes. Chicken Tacos are hands down one of my favorite weeknight meals. And while I have shared with you my Beef Taco Recipe, Taco Salad, and Pork Tacos, I have yet to share with you one of the EASIEST recipes for Chicken Tacos–and these are the tacos I make the MOST! And let me tell you, YOU want this recipe! Made with just a couple pantry ingredients, this easy recipe for Chicken Taco Meat just can not be beat. Instant Pot Chicken Tacos can be made in less than 30 minutes. Instant Pot Mexican Chicken is gluten free, dairy-free, Paleo and Whole30 approved. Even picky eaters LOVE these Instant Pot Chicken Tacos. You can make these Chicken Tacos with fresh or frozen chicken. You do not want to overlook the fresh lime and zest in this recipe. The added lime juice and lime zest is what make my recipe for Instant Pot Chicken Tacos the best recipe! 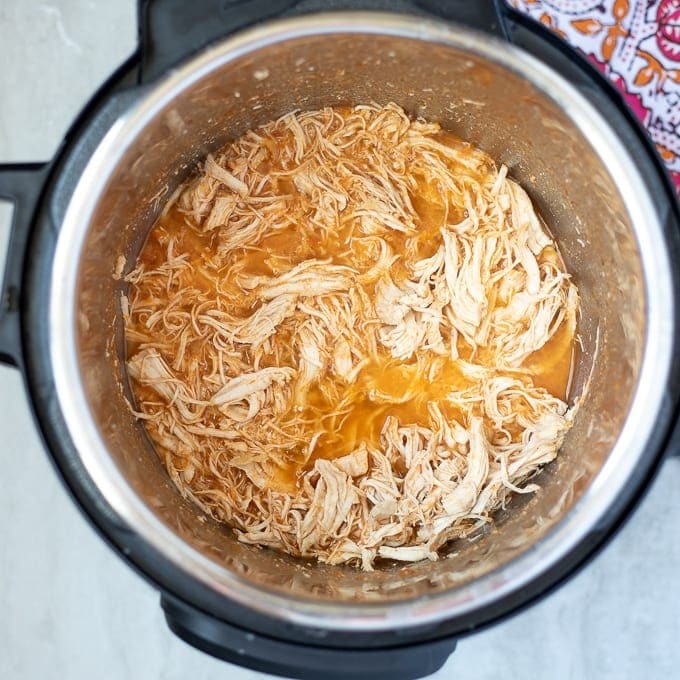 Place chicken stock and taco seasoning in Instant Pot and mix well. Place chicken breasts in chicken stock. Close lid on pressure cooker, pointing knob to sealed. Once cook time has elapsed, let pressure release naturally for at least 10 minutes. Using a hand-held kitchen mixer or 2 forks, shred the chicken right in the cooking juices. If you are worried about juice splattering, remove chicken from pressure cooker, shred and then return back to cooking juices. Those cooking liquids help to season the chicken meat. Stir in zest and juice of fresh lime. This Shredded Mexican Chicken is perfect for tacos, burritos, enchiladas, burrito bowls, or taco salad. A great tip is to use a slotted spoon to dish out Mexican Shredded Chicken to keep your taco from being soggy! Shredded Chicken Taco Meat is great to have on hand for lunches, busy nights and to stock in your freezer. This is why I always double or triple my recipe for Instant Pot Chicken Tacos. Use 1 cup chicken stock for up to 2 pounds chicken breasts, but double taco seasoning and salsa amount. One lime will still be enough to brighten this Chicken Taco Meat. For 3-4 pounds chicken breasts, use 2 cups chicken stock, and 3-4 times the amount of taco seasoning and salsa. You will also want to use 2 limes for this amount of chicken. 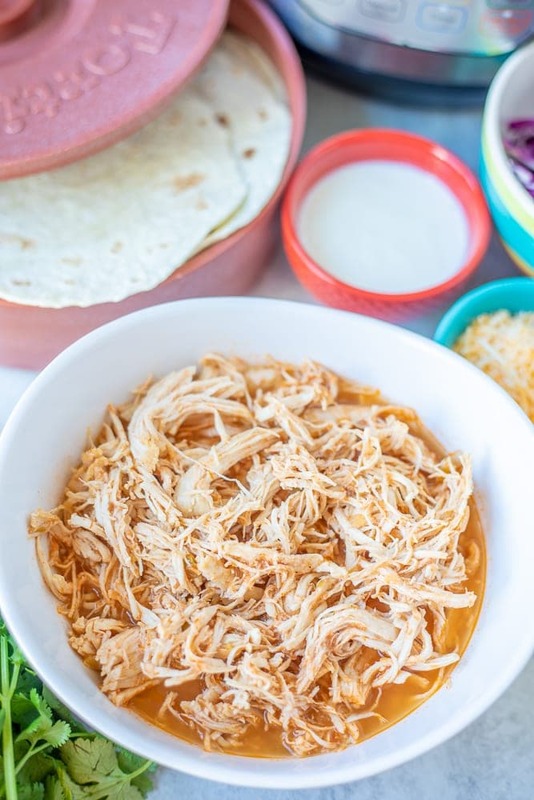 You can freeze leftover Instant Pot Mexican Shredded Chicken for up to 3 months in the freezer. 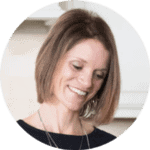 The chicken meat will last 3-4 days in the fridge–making this recipe for Instant Pot Chicken Tacos great for meal prep. This recipe was designed for 8 ounce chicken breasts, which is standard in most grocery store packs of chicken. 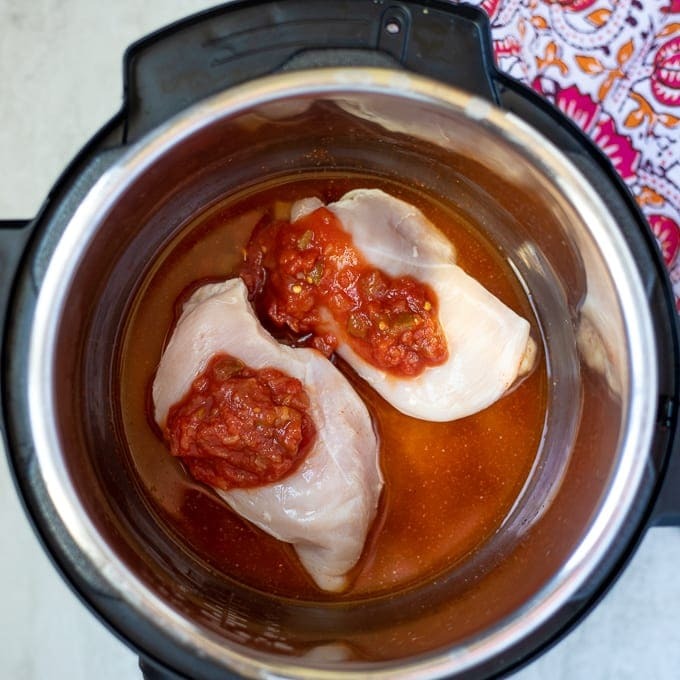 Be sure to check out my recipe for Instant Pot Chicken Breasts, which breaks down how to cook various sized chicken breasts in detail. Use any salsa you like for your Instant Pot Chicken Tacos. For an 8 quart Instant Pot, use 2 cups chicken stock to cook your chicken. 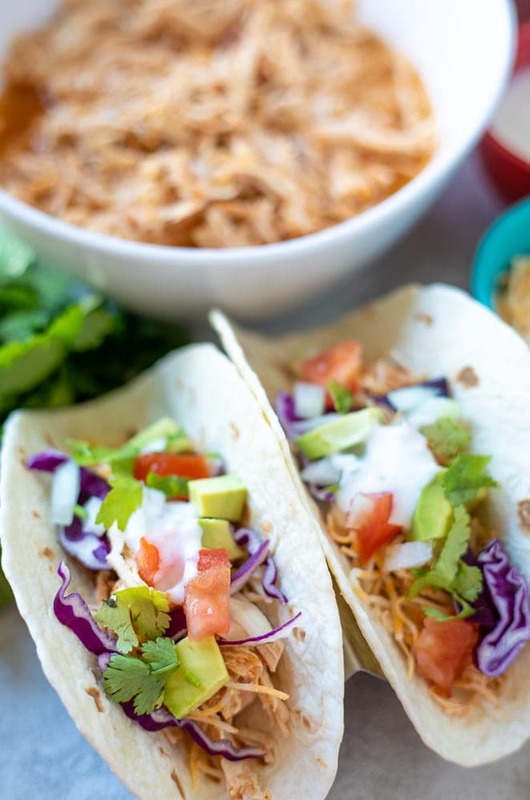 This recipe for Instant Pot Chicken Tacos uses pantry staple ingredients to create easy, healthy, chicken tacos. Pour chicken stock into pressure cooker. Add in taco seasoning and mix well. Place chicken breasts in chicken stock and top chicken with salsa. Close pressure cooker and point vent knob to sealed position. Cook on high pressure for 7 minutes for fresh chicken breasts, 11 minutes for frozen chicken breasts. Remove lid from pressure cooker and shred chicken using hand held mixer or two forks. Add zest and juice of fresh lime to shredded chicken and mix well. Serve as base for chicken tacos, in burrito bowls or in enchiladas. 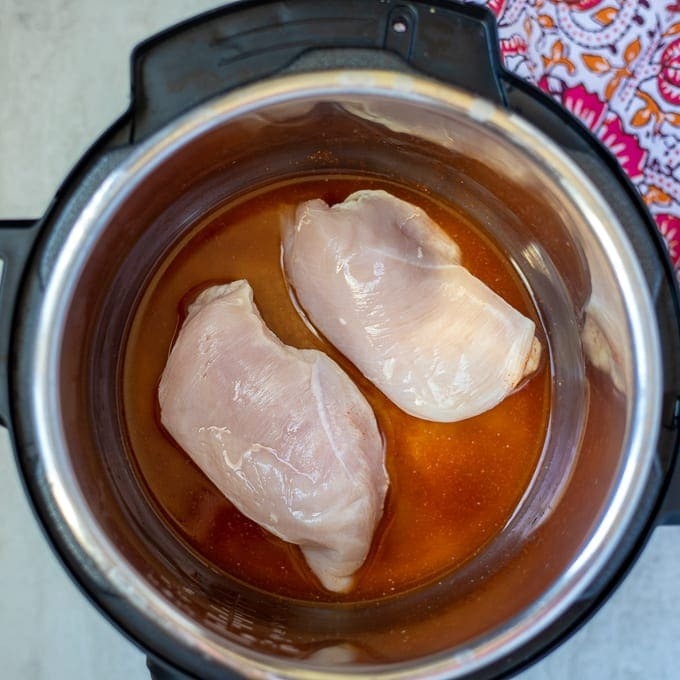 For an 8 quart Instant Pot, use 1.5 to 2 cups chicken stock to cook your chicken breasts in. This is a foolproof recipe for when you want something fast and flavorful on the dinner table with no fussing! And we all need that now and then!! Glad you enjoyed Renee! Chicken tacos are my absolute favorite and they have never been so easy! Thanks for the great recipe! I followed this recipe exactly and even made the homemade salsa! I was terrified of the instant pot and this was the first recipe I made! I’m a believer!! This recipe was delicious and I will never buy another taco seasoning packet from the store! Thank you so much for this recipe and keep them coming! WAHOO!!! 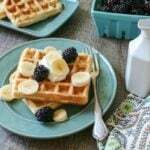 Thank you so much for sharing your success with this recipe! I LOVE LOVE when I can help people make meals at home they love.